Wrapping your hands is a fundamental component of boxing training. Boxers wrap their hands to protect the muscles, tendons, and ligaments in the hand and wrist from injury. Any kind of boxing is a contact sport, whether you’re working the heavy bag, hitting mitts, or sparring, and it puts a lot of pressure on your hands and wrists. Read on if you want to learn more about the type of pressure your hands are experiencing, the best way to mitigate injuries, and how to properly wrap your hands before you box. Wraps are designed to provide mechanical support to your wrist and hand in those situations where these factors may detrimentally affect the well-being of your fists. They can even protect you when you punch with poor technique. 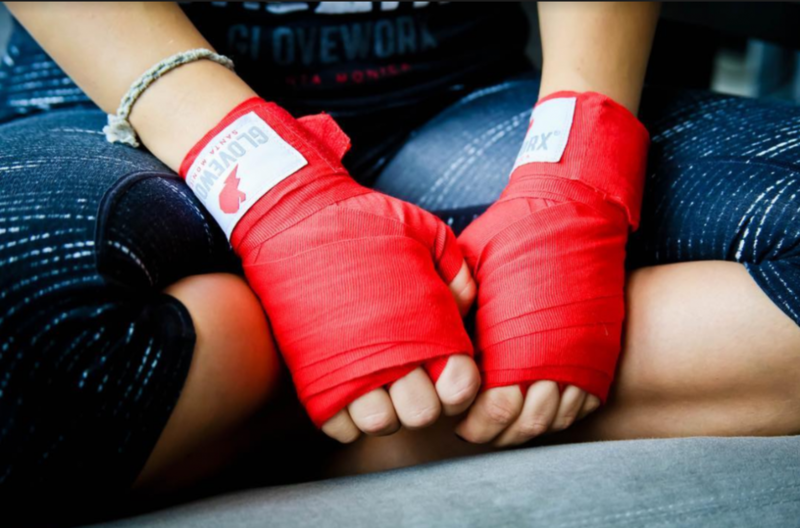 For those who are new to boxing and to Gloveworx, wrapping your hands for boxing is something we do before every BOOM and SIGNATURE session. Our coaches are there to help if you need it, but we encourage everyone to own this skill and learn how to wrap like a pro. You may have noticed that each coach at Gloveworx wraps hands a little differently. There are many ways to wrap hands, but the fundamental principle that each coach keeps in mind is that we need to protect the knuckles and the wrist from injury. While we do teach a basic wrapping method at Gloveworx, keep in mind that it may vary based on the size of your wrist and hand and the area you want to emphasize protection. Over time, you will develop a preference for how you want your hands wrapped and you’ll feel more comfortable wrapping them yourself, rather than having a coach do it. Wrapping your hands for boxing is a simple process. Follow the Gloveworx guide to wrap your hands in just 10 steps. Start by rolling the wrap up tightly—starting at the velcro and ending at the thumb loop. Put your thumb through the loop and begin wrapping over the top of the wrist. Wrap down your wrist twice and up your wrist twice. Wrap around the thumb and then over the top of the hand to the wrist. Wrap from your wrist to the top of your hand and wrap your knuckles twice. Bring the wrap down under the hand and over your thumb. Thread it through the web of each finger and back across the base of the thumb every time. Return to the knuckles and wrap them twice more for a final bit of padding. Wind the wrap down around your hand and wrist until it ends. Secure it with the Velcro strap or tape. As you’re wrapping your hands for boxing, make sure you keep your palm flat and your fingers spread at all times to ensure that your wrap is comfortable. Now you’re wrapped and ready—at least on one hand! The best way to get better at this skill is to practice it. Practice at home a few times before your session and you will be a pro in no time. If you have any questions about wrapping your hands for boxing, ask your coach at Gloveworx to help you out.